Family Pult warmly welcomes you! Enjoy nature with all your senses and take full advantage of the region's many sports and leisure facilities! We start your day with a lavish breakfast buffet which will leave you prepared for a fun-filled day in the great out-of-doors! In the evenings you can relax and unwind in our Alpine Sauna World and the Panorama Indoor Pools overlooking the stunning mountains around us. It is our aim to offer you the very best in Tirolean hospitality and service to make sure you enjoy your stay to the most! Rest and relaxation are guaranteed amidst the picture-book Alpine scenery. A perfect place to enjoy the year's most wonderful days far away from everyday routine. Welcome to Tirol, welcome to Alphof Sölden. Alphof Sölden - a place to feel good! Enjoy a variety of outdoor activities at any time of the year! Start the day with a substantial breakfast that will leave you prepared for an active and fun-filled day out in the mountains. Our cozy four-star hotel makes a fine retreat for a both active and relaxing vacation. Stunning views and a picture postcard mountain scenery are the perfect pre-requisites for people longing to leave the hustle and bustle of everyday life behind. Let us pamper you from start to finish, and enjoy a fabulous vacation in the mountains of Tirol. 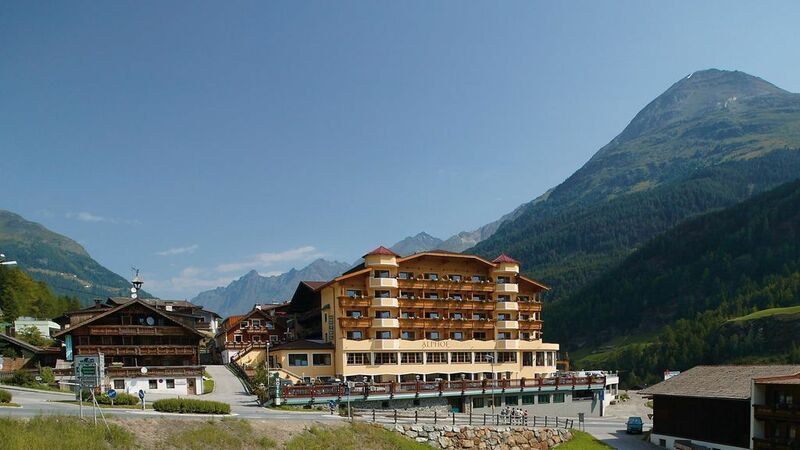 We look forward to meeting you - Welcome to the Alphof hotel in Sölden, Tirol! "Alpine Sauna World" and "Alpine Panorama Pool"
Welcome to the Alphof Spa! NEW: large ALPINE SAUNA WORLD in-house spa center! Hot Jacuzzi, log cabin sauna, low-temperature sauna, aroma steam room, rock shower (with rain shower and waterfall), relaxation area with fireplace. Also make use of the cardio and weightlifting equipment provided in the FITNESS AREA. TANNING BED with Aqua Fresh and aroma options. We spoil you with Tirolean specialties and international dishes! Our dishes are all lovingly prepared with top quality ingredients. In the mornings we spoil you with a lavish breakfast buffet, in the afternoons you can indulge in delicious cakes and pastries from the buffet in summer (in fall and winter we serve savory Tirolean "Marende" snacks). In the evenings we serve a choice of three 4-course dinner menus (3-course dinner in summer) with fresh salad from the bar. The Alpine Sauna Welt spa is open from 2.30 pm to 8.00 pm. No admission to the sauna for children up to the age of 14 years. Stylish seminar rooms and convention facilities offering daylight meeting rooms and superb view of the Ötztal mountain world. If you book 10+ rooms you can use the seminar room for free. - South: coming from Meran in South Tirol, continue via Timmelsjoch pass to Sölden into the Ötztal Valley (B 186). High alpine road on 2,500 m a.s.l. The border crossing is open June - late Oct only. Toss tax road. Airports: Zurich, Munich, Salzburg or Innsbruck. By train to Innsbruck or Ötztal. By bus to Ötztal valley.